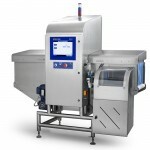 The system can help companies improve uptime and comply with HACCP principles. A new X-ray detector technology features a 0.4-mm high-sensitivity detector that enables the integration of a 100-W X-ray generator. The technology, provided by Mettler Toledo, offers improved detection levels with a 20% power reduction under standard operating conditions. The Safeline X-ray system includes software that “lends itself especially to ‘difficult’ or ‘busy’ images which contain varied density distribution, and is especially valuable for inspecting multi-textured foods and products that have a tendency to move around inside the packaging, such as boxes of cereal or bags of mixed nuts. In fact, detection sensitivity is unaffected by any type of packaging thus improving false rejection rates,” according to a company press release. The system enables the removal of contaminants before products leave a factory.